Don’t send your customers out the door with plain old white Styrofoam boxes anymore! 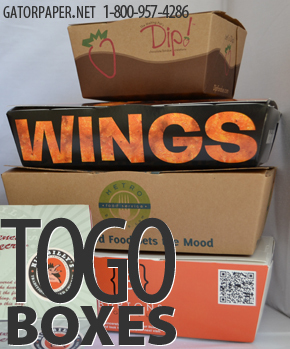 Gator Paper introduces their new custom printed to go boxes, also known as take out boxes. A brilliant way to place your brand name into the home of your customers. Gator Paper’s superior printing process guarantees your logo or design will look perfect on these to go boxes. We offer to go boxes in five different sizes and colors. Choose from white & black or brown uncoated Kraft. Whichever color will go best with your logo. Whether you are a stadium concession vendor, own a pizzeria, sandwich shop, of bakery our stylish to go boxes with get your customers going and your brand marketed all over town. Don’t forget to check out the entire product line offered by Gator Paper. We have a multitude of restaurant supply products, from clear plastic cups, beverage napkins, paper linen napkins, deli paper, butcher paper, freezer paper, white plastic cups, gourmet bags, handled shopping, and much more. All of our quality food packaging products are available for high color printing for added brand recognition. We offer to go boxes in five different sizes and colors. All of our quality food packaging to go products are available for high color printing. Do you need packaging supply products rush ordered? No problem, our customer service team is ready to discuss all minimum ordering requirements and rush order pricing. We are here to help you get what your business needs so we will accommodate our customers in any way possible. Call today to set up your order or check out our website for ordering information on each product. Gator Paper is the #1 source for all your custom printed Food Service needs. Specializing in custom printed Sandwich Paper, Deli Paper, Butcher Paper, Hot Paper, Eco Kraft Paper, Cups, To Go Bags, Napkins, TO GO Boxes, Paper Food Boats and more. We offer the lowest minimums in the country on all of our custom printed products. Let us help you develop your “brand” design or advertising concepts into custom packaging reality. From concept to delivery, Gator Paper is the short run custom printed food product leader. Gator Paper is the #1 source for all your custom printed Food Service Product needs.